You won't have to trick anyone into eating their veggies with homegrown peas. Sweet and tender, they are perfect fresh from the garden or cooked into a multitude of dishes. They also pack a lot of nutrition inside- vitamins A, C, K, and B and iron, folic acid, and many minerals. Records of peas occur in the Bible and in the ancient cultures of Egypt, Greece, and Rome. 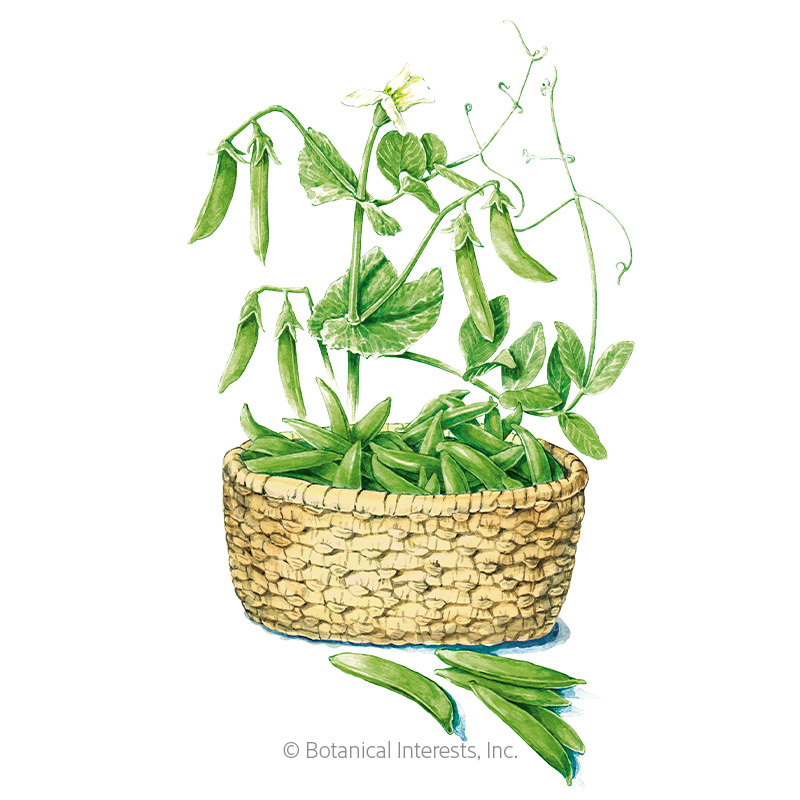 Plant breeder, Dr. Calvin Lamborn created snap peas in the 1970s when he crossed snow peas and shelling peas, with the unintended result of peas with fat, crunchy, edible pods with a sweet flavor. His 'Sugar Snap' variety won the All-America Selections gold medal in 1979. There are three types of peas. Snap peas have both crisp, sweet, edible pods and tender peas to be enjoyed steamed, stir-fried, or raw. 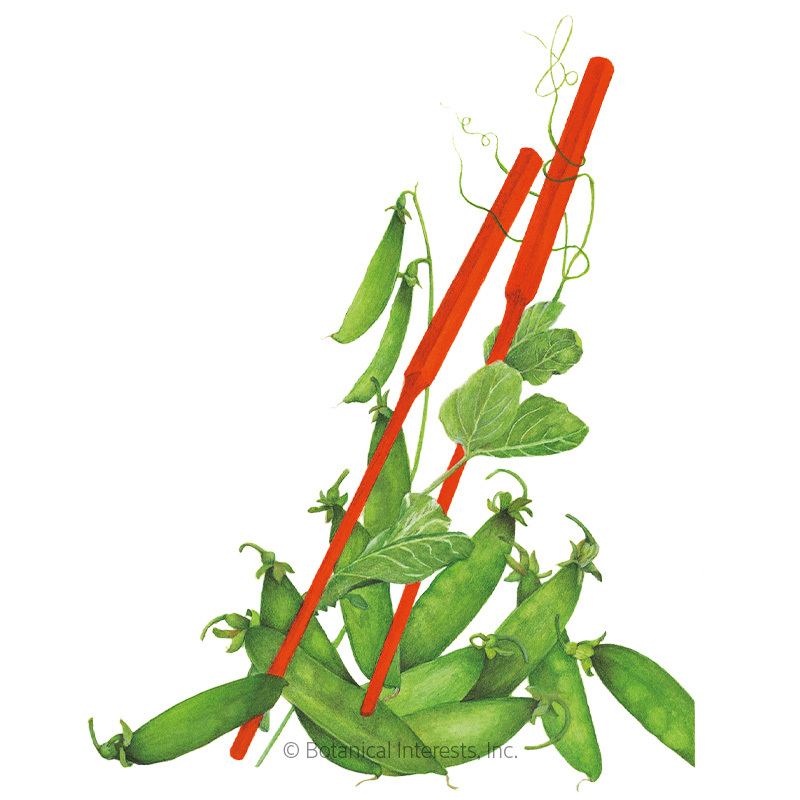 English or shelling peas, however, are grown for only their fat, sweet peas, as their pods are tough. 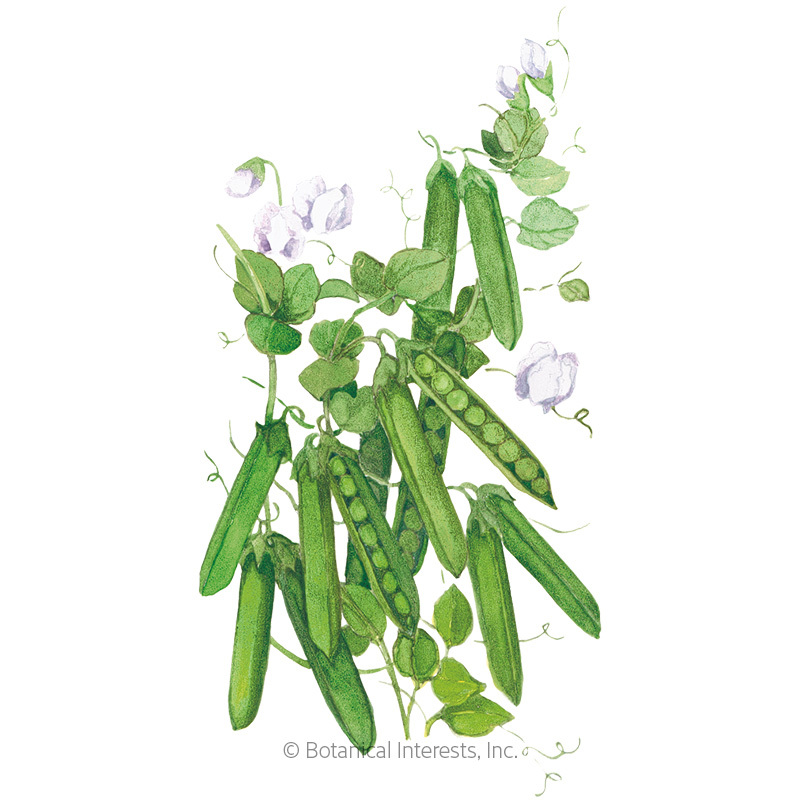 Snow peas have edible pods and should be picked while the peas are flat. With all peas, the sugars begin to turn to starch immediately after being picked; this is why grocery store peas don't compare in taste to homegrown peas. All parts of the pea plant are edible, too, including flowers, tendrils, and pea shoots. Edible peas (Pisum sativum) are not to be confused with non-edible, ornamental sweet peas (Lathyrus odoratus). When to sow outside: RECOMMENDED. 4 to 6 weeks before your average last frost date, when soil temperature is at least 40°F, ideally 60°-80°F, and again 10 to 12 weeks before your average first frost date. In mild climates, sow in fall or winter for winter harvest. Best grown in temperatures less than 85°F. Special sowing instructions: Soak seed in water for 12 to 24 hours before sowing; this is not required but hastens germination. Raised beds are recommended because of better drainage, and in early spring, the soil in raised beds warms more quickly than in flat garden beds. You may need to treat seed with an inoculant (Rhizobia bacteria) to increase yields if you have acidic soil, it is early in the spring, or if you have not grown peas in that area recently. Sow seeds 1" deep and 2" apart. If sown next to a structure on which to climb, rows can be on both sides of the structure. Growing on supports makes harvesting easier and encourages airflow, which reduces the potential for disease. If plants are grown on mounds, space short types (under 4') rows 18" apart, while taller varieties should be spaced in rows 4' apart. Peas grow best in fertile, well-drained soil that is rich in organic matter. Amend beds prior to sowing. Water regularly but don't allow soil to be soggy. A little extra water when the temperatures start to warm up will promote the best quality peas. Best grown in temperatures less than 85°F. Choose an area with full sun (6 or more hours per day). Not necessary in fertile soil; peas are a legume and produce their own nitrogen. Peas perform best with cool roots; when temperatures begin to warm, mulch soil surface to keep them cool. 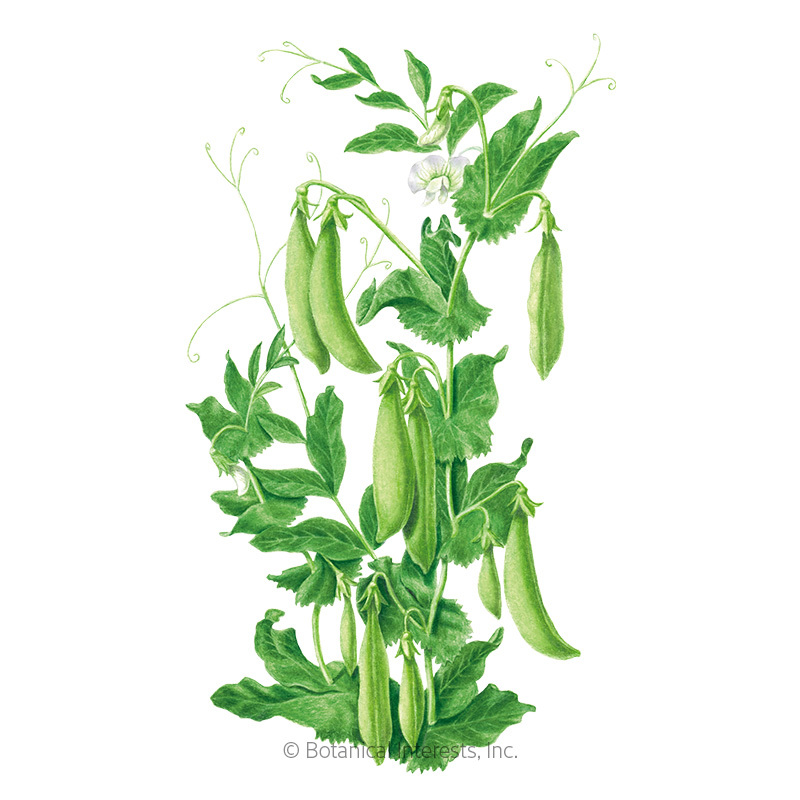 Shelling peas should be harvested when the pods are plump, about 3 weeks after flowering. Peas that are too mature are tough and will cause the plant to stop producing; therefore, harvest regularly when pods are at their peak. Use scissors to harvest or hold vine with one hand and pick the pods with the other; vines are fragile. Snap peas should be harvested when peas are plump; pick regularly to increase yield. Use scissors to harvest or hold vine with one hand and pick the pods with the other; vines are fragile. Snow peas should be picked before the seeds start to form. Peas that are too mature are tough and will cause the plant to stop producing; therefore, harvest regularly when pods are at their peak. Use scissors to harvest or hold vine with one hand and pick the pods with the other; vines are fragile. Pea flowers are edible and taste lightly of peas. Often, pea flowers come in pairs from the same stem. Harvesting one of the pair will not reduce yield. Pea leaves and tendrils are also edible, tasting lightly of sweet peas. The newest growth is the most tender. When plants are a few inches tall, select 2"-4" shoots from the top of the plants and pinch them off using your fingernails or scissors, leaving at least one set of true leaves on the plant. As plants grow you can also harvest the end-most growth in this same way. Fresh: Peas are best eaten on the day of harvest shortly after picking, but may be stored clean and dry in the refrigerator for a couple of days. Frozen: Blanch for 2 minutes. Cool in ice water, drain, freeze in a single layer on a cookie sheet and then store in freezer-safe containers. Powdery mildew looks like a white powder on leaves, and thrives in hot weather with high relative humidity and cool nights. Reduce chances of this disease by watering only in the morning and during the day. Keep leaves dry; do not water plants overhead. Provide good air circulation by proper plant spacing. Do not compost diseased plants; spores may over-winter and re-infect crops the following season. Powdery mildew is more common in the fall and choosing a resistant pea variety for fall sowing further reduces the likelihood of infection. Aphids are among the most common and troublesome garden pests. They feed by sucking plant sap, which causes distorted leaves, buds, and flowers, sometimes spreading plant viruses in the process. Aphids excrete a sticky honeydew which attracts ants, and is a host for black, sooty mold. Knock aphids off plants with a strong stream of water-repeat frequently as needed. There are many native predators and parasites which can control aphids; attract them by planting pollen and nectar plants. For heavy outbreaks, spray insecticidal soap, neem (an extract of the tropical tree, Azadirachta indica), or homemade oil sprays. Oil sprays work by smothering the insects and mites they come in contact with; thus, thorough coverage is important.